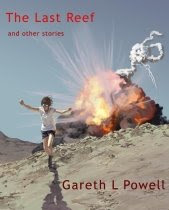 I’ve been following Gareth L Powell’s work, or ‘the other Gareth’ as I like to call him, since we both had stories in ‘Aphelion’ in April 2005. ‘Six Lights Off Green Scar’ is one of the stories reproduced in this collection. What struck me about it at the time was the terse prose that somehow conveyed a mass of sensory information in few words, a quality that continues to define GLP’s work. Since then we’ve corresponded regularly and met up a couple of times, I joined Gareth’s Friday Flash Fictioneers, though I believe I coined the title, and we’ve collaborated on a flash fiction anthology (still available from OddTwoOut press). Having read all of this you may conclude that my review will be rather biased. Well you’d be wrong and I resent the implication.